A make up case can make life so much easier, whether you are a makeup junkie, or simply need to be able to carry your face around in a safe, uncluttered way. We'll start by outlining the best solutions for you, depending on your storage and travelling needs. When you organize your makeup cases, this makes your beauty routine a bit more streamlined. It also makes decisions about which look to go for easier to make. Your first option is a soft, catch all makeup bag instead of a hard makeup case. You don't spend much money, and can organize it by taking a page from my grandmother’s makeup book… The bags within bags method! Buy smaller lipstick and eye shadow bags to put in your make up travel bag to replicate the organization of a train case. The thing about softer bags, is that if they're too big, hey wont hold up well. So you might end up with no choice BUT to compartmentalise using smaller, steadier bags. If you know that you just need something for 4 or 5 products, a smaller bag will work better for you. The bag needs to be solid and sturdy, so that your tools of the trade don't get all jumbled up and shaken. Professional makeup artists have a really heavy load to bear. So it needs to be sturdy, and easy to carry, and majorly organized. For this, we're talking some big, suitcase like cases that cannot be healthy for a regular woman on the streets to own. 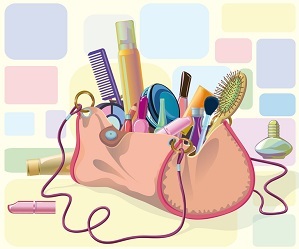 If you are and individual with a smaller make up case, arrange it the reverse order of your routine. So for example, let’s say you do your foundation first, then eyes, cheeks and lips. Then you’ll place lip, cheek and eye makeup on top. The foundation makeup and tools will go at the bottom. So when you apply the makeup, you’ll start at the bottom. If you’re a budding makeup artist, you can also arrange your makeup in bunches of color combinations! So when you have someone with a certain color skin, you have all the products that will work for that skin tone in one section. For example, concealer, bb cream, and color correctors, and blush for each skin tone go in one compartment. Then the eye shadow combinations that work together have one section each. That way you don’t have to sift through every compartment for the things that you need!